Caption slip reads: "Photographer: Swaim. Date: 1960-12-12. Reporter: Swaim. Assignment: Wind tunnel auction. 9: Sign on outside of Co-op wind tunnel bldg. 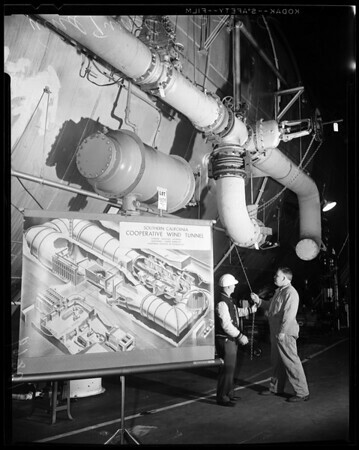 10, 27: Sol Gross (left) and Henry Jardine standing beside cutaway drawing of giant wind tunnel, with part of exterior of tunnel background. 28: Henry Jardine and airlock. 31, 32: Henry Jardine inside tunnel, 20 feet diameter, showing giant blade system of 40,000 horsepower wind motors".